Kolten Wong has been sensational at second base this season. 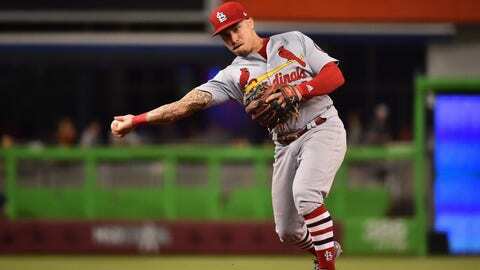 ST. LOUIS – Kolten Wong‘s pursuit of a Gold Glove has been dealt a blow. Wong, whose season-long excellence at second base has become particularly evident during the St. Louis Cardinals’ surge, was placed on the 10-day disabled list with a left hamstring strain Tuesday. Despite rating at the top of numerous defensive metrics among National League second basemen this season, Wong could be hampered in his hopes of winning the award for the first time in his career by not playing enough games early in the year while working out problems at the plate. Being sidelined again won’t help his cause. Wong, 27, injured his hamstring while running out a ground ball Saturday at Colorado. A .342 batting average since the All-Star break (10th best in the league) has helped him raise his season average to .244. He also has eight home runs and 32 RBIs in 110 games this season. Replacing Wong on the active roster is infielder Patrick Wisdom, who was recalled from Triple-A Memphis. Wisdom, 27, reached the majors for the first time in his career Aug. 11 and batted .333 with a home run and three RBIs in nine games. On Aug. 21 he was returned to Memphis, where he is batting .288 with 15 home runs and 61 RBIs in 107 games. He had played in 747 career minor league games before his big-league debut.